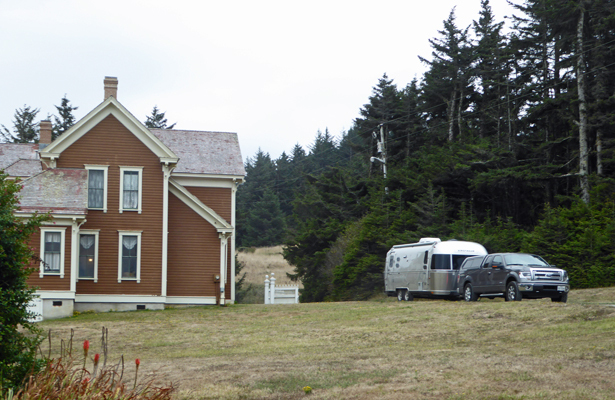 We were camp hosts at the Historic Hughes House at Cape Blanco State Park in Port Orford, OR for the month of October 2016. Hughes House is located near the Sixes River in the lower elevations of Cape Blanco State Park. Cape Blanco is located about 6 miles north of the town of Port Orford, OR on the Wild Rivers Coast of southern Oregon. The park includes 1,895 acres of what was once a large dairy farm owned by the Hughes Family. There is now a first come first served campground with 52 electrical sites and 4 cabins on the upper portion of the cape with access to a wonderful sandy beach (via a steep one-lane road) where you can view the actual cape and its lighthouse. This is the western-most point of Oregon and it is very windy and wet much of the year. The lighthouse is open for tours Wednesday through Monday from 10 am to 3:30 pm. The hosts who give tours at the lighthouse live in the Cape Blanco campground. As the hosts of Hughes House we lived in a campsite just behind Hughes House next to a service barn and the manager's residence. 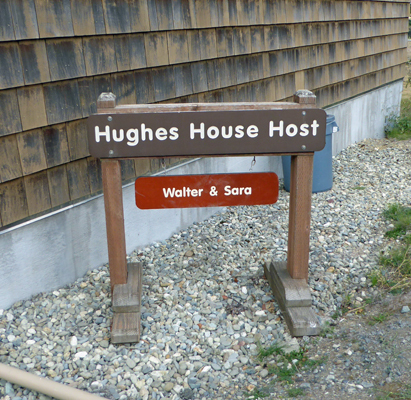 We even had our own Hughes House Host sign--something we haven't always had even when we were site cleaning hosts in other parks. To get to the host site, you go down a short drive behind the house and then pull into the spot behind a hedge. Hughes House is open Wednesday through Monday from 10 am to 3:30 pm. They offer a tour of the downstairs of the house for donations and a self guided tour of the upstairs. We manned the house Thursday through Sunday (4 days) giving tours, selling a few items in the small gift shop and answering questions. Occasionally someone would come asking how to get to the lighthouse, but since Hughes House is off the main road we rarely had anyone ask any other questions about the park. 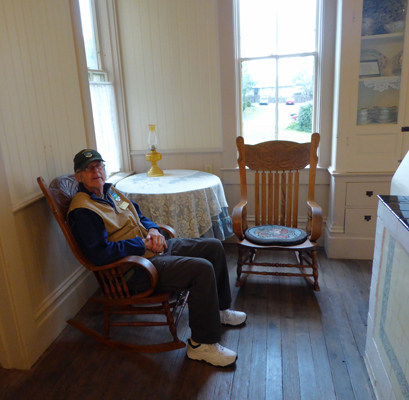 The Cape Blanco Heritage Society maintains in the inside of the house and manned the house on Mondays and Wednesdays. 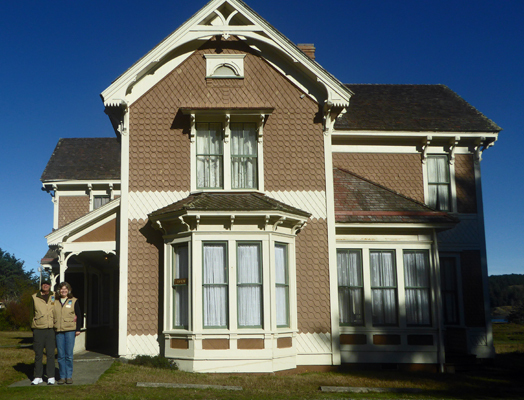 Here's a link to Sara's tour of the house. 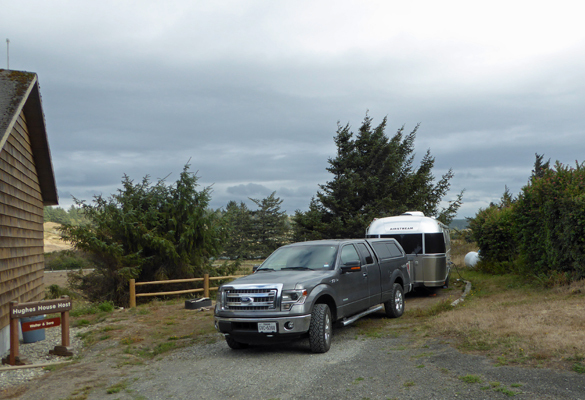 We'd leave our trailer at about 9:45 and walk (or drive if it was raining) up the little hill to the house. We'd open up, turn on all the lights and put out the open sign. And then sit down in the kitchen and wait for our first visitors. The rocking chairs are comfortable and the house is heated (we'd turn the thermostat up from its night time setting of 62 when we arrived) so it's warm and dry--a perfect hosting position during the rainy month of October. At the end of the day (3:30 pm) we'd close up by turning off all the lights, putting out the closed sign, and toting up the donations and gift shop sales for the day. Then we'd arm the alarm system and lock up the house. We'd usually be back in our trailer by 3:45 at the latest. Early in the month we had 25 to 45 visitors each day and that would keep us busy much of the time. We'd bring our lunch in a cooler and grab a bite when there was a moment. On Sunday's however, we rarely had a visitor before noon so we always made sure we brought something to read to wile away the time. It was a particularly wet and windy October (twice normal rainfall with over 14 inches of rain) so the second half of the month was pretty quiet. We were closed one day because the power went off in a wind storm. And the lighthouse was closed that entire weekend because of high winds. We had very few visitors those 4 days with a high of 14. The next week the weather was a bit better and we were back up in the high twenties each day which was better but still awfully slow. As usual, we received our full hook up hosting campsite free in exchange for the 24 hours or so each of us were on duty at the house each week. It most certainly was not hard duty--we both read a lot of books over the month and paced the house when we got restless. Port Orford is only 8 miles from the Hughes House and there is a nice Laundromat (Busy Bubbles) and a decent if somewhat densely stocked grocery store (Ray's) in town. There's also a very nice hardware store. There are several restaurants in town too. The library is very nice and has a good Wi Fi signal. Port Orford only has a population of 1190 so it's not a big town. Folks who want a bigger grocery store go to Bandon which is 28 miles from Hughes House to the north. There are two grocery stores there and a Rite Aid drug store too. Bandon is a tourist town with lots of restaurants, gift shops and tourist stuff in Old Town Bandon and a number of large high end golf courses. It's a higher class town with many more large high-end beach houses on the south end of town. With 3 days off each week we had plenty of time to handle day to day chores (and we weren't tired so we really didn't need to rest) while exploring the area. 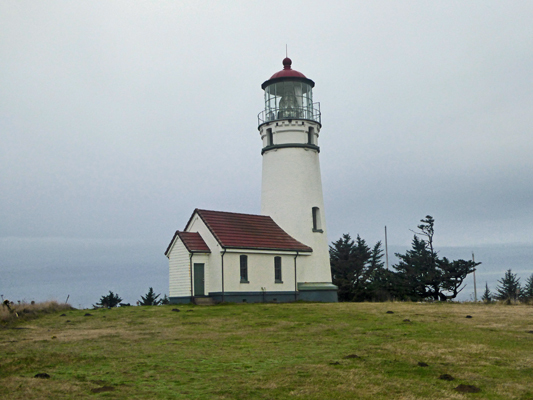 There are 5 state parks nearby (Cape Blanco, Port Orford Heads, Humbug Mountain, Tseriadun and Paradise Point State Parks). 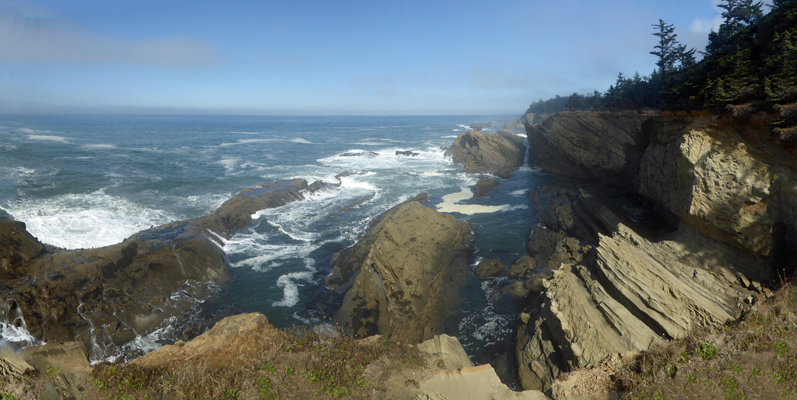 There are 3 more small state beach parks south of Bandon (China Creek, Devil's Kitchen and Face Rock State Parks). And there are 3 more state parks up near Charleston (outside of Coos Bay) in the form of Sunset Bay, Shore Acres and Cape Arago. We found places to hike and explore in all of them. Our Verizon phone and hot spot both worked at our host site--though the hot spot worked much better with our booster and when the weather was bad we had no service at times. Our Sprint phone didn't work in the park but it did work in town. If you like to fish both the Sixes River (just down the hill from Hughes House) and the Elk River (about 2 miles south of Cape Blanco) both have good fishing. The Chinoook began their fall run in October after our first big storm and there were LOTS of fisherman using the boat ramp on the Sixes (until the next storm muddied the river again). 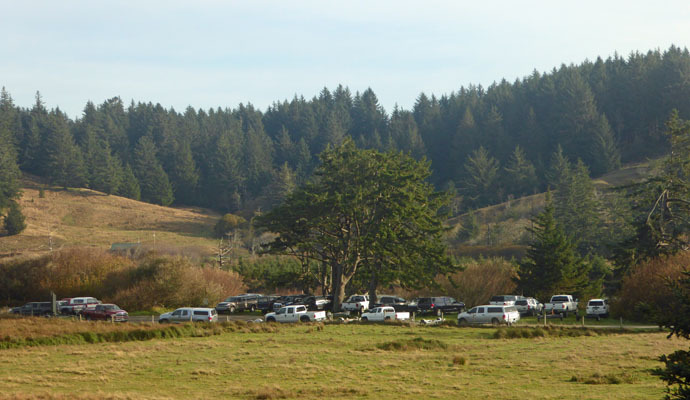 Cape Blanco State Park is a good place to host. We got our script for the Hughes House Tour about a month ahead of time and we got a quick basic training on opening and closing the house from the Cape Blanco Heritage Society docents who man the house on Mondays and Wednesdays. The host coordinator has a large group of hosts to supervise--the Lighthouse Hosts, the Hughes House Hosts, the Campground Hosts and the hosts who man the Life Saving Station museum down at Port Orford Heads along with lots of other duties. So we didn't see him much but he was available if we needed him. I wouldn't suggest signing up to do tours at Hughes House in October (or probably April either) because it was so slow but I'm sure you'd have plenty to do May through September. The folks who come to tour the house are pretty much interested in tours though there are some folks who just want to look around and that's okay too. I found that about 50% of the folks were really interested in what we had to say and the rest just went along for the ride.